Acadiana, the traditional Cajun homeland and the stronghold of both the Cajun French and Cajun English dialects. 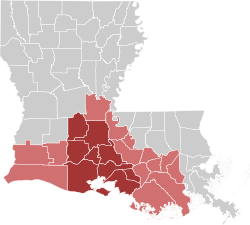 Cajun English, or Cajun Vernacular English, is the dialect of English spoken by Cajuns living in southern Louisiana and, to some extent, in eastern Texas. Cajun English is significantly influenced by Cajun French, the historical language of the Cajun people, who descended from Acadian settlers and others. It is derived from Acadian French. This differed markedly from Metropolitan or Parisian French in terms of pronunciation and vocabulary, particularly because of the long isolation of Acadians, and even more so of Cajuns, from the Francophone world. English is now spoken by the vast majority of the Cajun population, but French influence remains strong in terms of inflection and vocabulary. Their accent is quite distinct from the General American. Cajun French is considered by many to be an endangered language, mostly used by elderly generations. But Cajun English is spoken by even the youngest Cajuns, and is considered to be part of the identity of the ethnic group. The deletion of any word's final consonant (or consonant cluster) is common. Therefore, hand becomes [hæ̃], food becomes [fuː], rent becomes [ɹɪ̃], New York becomes [nuˈjɔə], and so on. Many vowels which are distinct in General American English are pronounced the same way due to a merger; for example, the words hill and heel are homophones, both being pronounced /hɪɹl/. Stress is generally placed on the second or last syllable of a word, a feature inherited directly from French. The voiceless and voiced alveolar stops /t/ and /d/ often replace dental fricatives, a feature used by both Cajun English speakers and speakers of Louisiana Creole French (Standard French speakers generally render dental fricatives as alveolar). Examples include "bath" being pronounced as "bat" and "they" as "day." Cajun English speakers generally do not aspirate the consonants /p/, /t/, or /k/. As a result, the words "par" and "bar" can sound very similar to speakers of other English varieties. The inclusion of many loanwords, calques, and phrases from French, such as "nonc" (uncle, from the French oncle), "chèr" (dear, pronounced /ʃæ/, from the French chèr), and "making groceries" (to shop for groceries, a calque of the Cajun French faire des groceries (épicerie)). These are a few other examples. Fais do-do : Refers to a dance party, a Cajun version of a square dance. Dis-moi la vérité ! : Tell me the truth! Quoi faire ? : Why? Sha/chèr (a is pronounced like a in apple) : Dear or darling - also used as "buddy" or "pal"
Mais non, chèr ! : Of course not, dear! To "save the dishes" means to "put away the dishes into cupboards where they belong after being washed". While dishes are the most common subject, it is not uncommon to save other things. For example: Save up the clothes, saving the tools, save your toys. "Getting/Running down at the store" involves stepping out of a car to enter the store. Most commonly, the driver will ask the passenger, "Do you want to run/get down with me?" One can get down at any place, not just the store. The phrase "get down" may come from the act of "getting down from a horse" as many areas of Acadiana were only accessible by horse (or boat) well into the 20th century. It also may originate from the French language descendre meaning to get down, much as some English-Spanish bilingual speakers say "get down," from the Spanish bajar. In the television series Treme, Cajun English is often used by most of the characters. In the television series True Blood, the character René Lernier was introduced with a Cajun accent. In X-Men : The Animated Series, the character Gambit was introduced as from Louisiana and is known to speak in a thick "Cajun" accent. However, his accent sounds more like the African American vernacular instead of a Cajun accent. In the television miniseries Band of Brothers, the company's medic Eugene Roe is half-Cajun and speaks with a distinct accent. Likewise, Merriell "Snafu" Shelton from a companion miniseries The Pacific. In the television series Swamp_People, Troy Landry speaks with a strong accent. Spoken by chef and humorist Justin Wilson on his cooking shows for PBS and his comedy albums. In the Heat of the Night: Season 2, Episode 12; "A.K.A. Kelly Kay"; Jude Thibodeaux ( Kevin Conway ) comes to Sparta in search of a former prostitute he controlled in New Orleans. Cajun accent is prominent. In the movie The Big Easy, Cajun English is often used by most of the characters. Several characters of Gabriel Knight: Sins of the Fathers, particularly the narrator, have Cajun accents. Some characters even use Cajun French phrases. 1 2 Dubois, Sylvia and Barbara Horvath (2004). "Cajun Vernacular English: phonology." In Bernd Kortmann and Edgar W. Schneider (Ed). A Handbook of Varieties of English: A Multimedia Reference Tool. New York: Mouton de Gruyter. p. 409-10. ↑ Valdman, Albert. Dictionary of Louisiana French. University Press of Mississippi. p. 655. ISBN 9781604734034.